April 30th & May 1st 2011. Oklahoma City, OK. The last show of the season! It felt so good to know we made it through the entire 2010/2011 TICA show season. It was a lot of work, more than I imagined, but Bruno and I managed to get all the way through. I am so proud of Bruno. He’s an amazing Ragdoll. I give all the glory to God on this one. Plus, it’s just amazing how He used a Ragdoll kitty to reveal to me His unconditional love. To me, a lot of good life lessons learned. To Bruno, my undying love and devotion forever. To God, all the glory forever and ever. Amen. A special note: I think it’s worth mentioning that Bruno received a 2nd Best AB from Hisako Yamada in the kitten class exactly a year ago. That’s beautiful symmetry and a very fitting way to end the show season. April 9-10, 2011. San Antonio, TX. Bruno was Best of Breed Ragdoll Cat in show! Another great show for Bruno. We picked up another 187 points. Those points are getting harder and harder to gain. We’re down to two more shows and then it’s the end of the show season and we can finally take a break. It’s been exhausting, but fulfilling. I kept Bruno out of all four specialty rings at this show because we can no longer use points from those rings so it gives the other Ragdolls a chance to work on their titles. March 12-13, 2011. 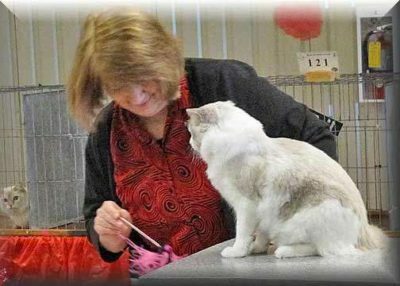 Colorado Springs, CO. Bruno was Best of Breed Ragdoll Cat in show! Then other shows are worth all the extra money it takes to get to the venue. This trip to Colorado Springs proved to be perfect for Bruno. But then I’ve always been a huge fan of southwest region shows. We gained 255 points and made the huge milestone of passing the 10,000 point mark. March 5-6, 2011. Vinton, LA. Some shows are hardly worth the trip as this show proved to be. I knew the judges were all wrong for Bruno, but on the bright side he did pick up 49 points. Some additional pictures of Bruno at the Waco Show courtesy of Saroko Cattery! December 10-12, 2010. Corpus Christi, TX. 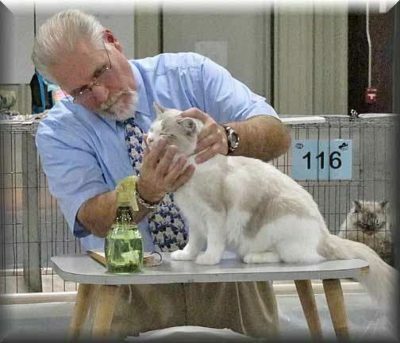 Bruno was Best of Breed Ragdoll Cat in show! It was a tough show. A lot of high scoring cats attended. 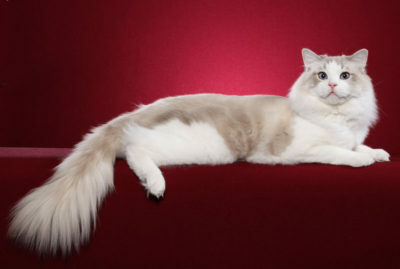 As a result, Bruno made best of breed Ragdoll in ten out of 18 rings, but was only called back for four finals. Yet, I’m happy that he did receive those finals because he was able to advance his points even just a little bit. Fate Mays puts on a terrific show. Frances Harshaw was the best hospitality lady ever. 🙂 Can’t believe it won’t be until February that we’re back showing in Texas, but we’re looking forward to our next show and seeing all our friends next year. Have a Merry Christmas and a Happy New Year! December 3-5, 2010. Tucson, AZ. 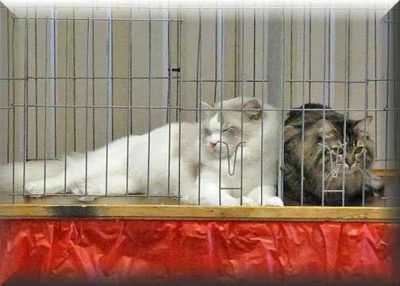 Bruno was Best of Breed Ragdoll Cat in show! What a fantastic show. I’m so glad I made the trip to Tucson. Everything about my show weekend was magnificent — the show/hotel venue, the fantastic exhibitors, the tasty food prepared by the club members, all the great memories I made, etc. I will never forget this show. It will always hold a sweet memory for me. Perhaps because it was great seeing old friends while hanging out with my current ones, or maybe just because I felt that much closer to California’s sunshine. But in any event, I’m just happy about the whole experience. November 20 & 21, 2010. Waxahachie, TX. Bruno was Best of Breed Ragdoll Cat in show! Words cannot describe the joy showing Bruno brings to me. Bruno is a once in a lifetime Ragdoll for me, and now that his mother’s been spayed, he’s all I have left of her lines and I want to do Daphne proud. Bruno is so easy to show. He gets that from his father, Aristede as well as his mother. Bruno is the end result of many years of breeding on my part for what I consider to be a nearly perfect Ragdoll. I’d say perfect but there’s always room for improvement. 🙂 In any event, he’s the perfect balance between his father, Aristede, and his mother. Bruno in Al Walbrun’s ring. November 5-7, 2010. 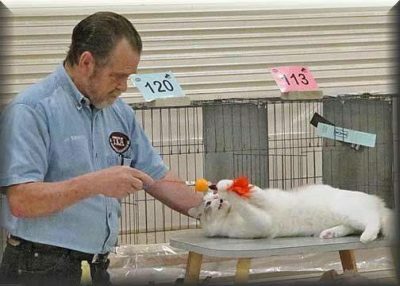 Lancaster, PA. Bruno was Best of Breed Ragdoll Cat in show! This was my first time attending the Lancaster show, and it’s a big show with a lot of down time inbetween the rings. I like a faster paced show in general, so I’m not certain this will become an annual event for me. One thing’s for sure, a lot of excellent Ragdoll competition. Bruno went neck and neck with three other top quality Ragdolls the entire weekend. The big surprise and cause for considerable excitment was that Laszlo’s littermate sister, RegencyRags Simply Delicious of Willowtreerags, won an 8th Best AB kitten final out of something like 80 kittens. Way to go Della and Mable! October 23-24, 2010. Albuquerque, NM. Bruno was BEST IN SHOW! as well as Best of Breed Ragdoll Cat in show! Another great show for Bruno. He’s simply the most loving and devoted cat I’ve ever had and I feel so honored that Bruno is my current show companion. His spirit is so gentle and when we’re at the shows he does his very best to please me. Bruno is definitely the best cat I’ve ever had — even above Aristede and Angelique. I know – unbelievable. But that’s how special he is to me. October 16-17, 2010. Tukwila, WA. Another great show for Bruno. This time he picked up his Supreme Grand Champion title! I’m so pleased and excited by this handsome boy. I also picked up my new seal mitted girl — Hugaragdoll Amazing of Regencyrags. She’s a regular beauty queen, that’s for sure and proved it by taking home four finals. 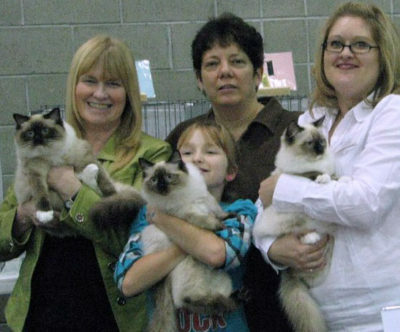 Adriana Kajon brought back three Ragdoll kittens for her All Breed Kitten Final. What an honor for three non-bicolor kittens! with the Best AB kitten held by Lorna of CashmereRags on the left. October 2-3, 2010. Austin, TX. Bruno was Best of Breed Ragdoll Cat in show! Another great show for Bruno. He’s still having a great time showing off his best qualities — and he has a lot of those. 😉 Just like a teenager would, Amy announced she’s no longer into this showing deal, so I let her sit out this time. I’ll bring her back later once she’s in the adult class. I also brought along Laszlo, the three month old boy out of Aristede x Sabrina. The first day he was so scared of all the noise and the other cats, but once he found out he got to play with lots of toys and got treats he settled down and enjoyed himself. I can’t wait until his first kitten show. Hopefully I’ll be posting Laszlo finals within the next month! September 18-19, 2010. Wichita, KS. Bruno was Best of Breed Ragdoll Cat in show! What an amazing show! First off, it was so much fun and I met a bunch of new exhibitors — some I know will be long time friends. We helped run each other’s cats, notified each other of the rings we were in and if our cat had a final. Just a great group of people. This is definitely a show I’ll consider for next year. The big news is Bruno is now a Quadruple Grand Champion! He’s an amazing boy. In all twelve rings he was Best of Breed Ragdoll. I’m so happy with the way he continues to develop into a strong muscular Ragdoll with a long body, long legs, long tail, super plush and silky coat put altogether with that incredible Ragdoll personality. August 21-22, 2010. Lafayette, LA. Bruno was Best of Breed Ragdoll Cat in show! Another highly competitive show. There are several beautiful Ragdolls currently competing in the SC Region! Although, the good news is that Bruno earned his Double Grand this weekend. We are looking to Triple or even Quad at his next show! Amy had stiff competition from two gorgeous bicolors. It’s always difficult for the mitteds to compete, but she still ended up taking home two bitty finals. Fate Mays gave her honorable mention in his ring. title in Nancy Parkinson’s ring! title in Pam Barrett’s ring! July 31 – August 1, 2010. 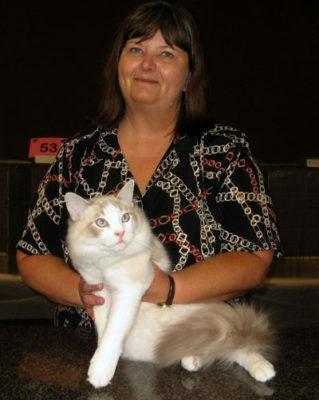 Denver, CO. Bruno was Best of Breed Ragdoll Cat in show! What a fantastic show! This was my first time in Colorado and I certainly did enjoy it. I came home with plenty of finals, a new champion, and some new Ragdoll friends. One of the joys of traveling to shows outside my region is the new friendships I make with not only Ragdoll breeders, but with other exhibitors as well. Of course, the biggest news is that Bruno is now a Champion with two finals away from his Grand. Amy also made a promising debut. She’s a good size girl with an exquisite scoop and extra strong chin. I’m absolutely in love with this amazing girl. She earned her first final at only four months old in an All Breed ring consisting of 41 other kittens! 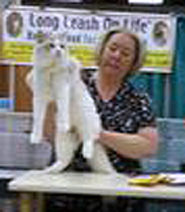 She earned Best of Breed Ragdoll Kitten in 7 out of 12 rings, but was only called back for the one final. The competition was stiff to say the least. But we are thrilled that Bobbi adored our girl as much as we do and that she brought her back for that final. June 27, 2010. Orange, TX. For the first time in years, I only attended one day of the two day Orange, TX show. 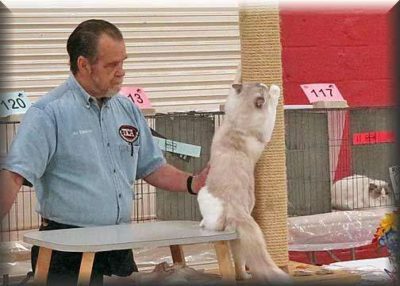 As such, there’s no chance of Bruno’s attaining Best of Breed Ragdoll for the third time in so many shows, but by attending at least one day of the show he was able to keep up his show persona. It’s very easy for young adults to fall out of their show habits, which is why we keep running them through their kitten career. Bruno receives a BEST AB Kitten in Debbie Brown’s ring!